The White Pass & Yukon Route was built during the Klondike gold rush of the 1890s. It climbs from the deep water port of Skagway, Alaska, USA, up into the mountains, 67.5 miles to Carcross, Yukon, Canada. It was built to service the mining industry and operated until 1982. The line was reopened in 1988 as a scenic railroad. The majority of its passengers come from cruise ships which tie up within easy walking distance of the waiting trains. The line ambles past Skagway and into the mountain forest, following the dangerous path early prospectors once took on foot or by mule. We enjoyed the steep climb through Alaska's spectacular scenery. We rolled across timber trestles and rumbled through tunnels, easily understanding why the White Pass & Yukon Route calls itself "The Scenic Railway of the World". 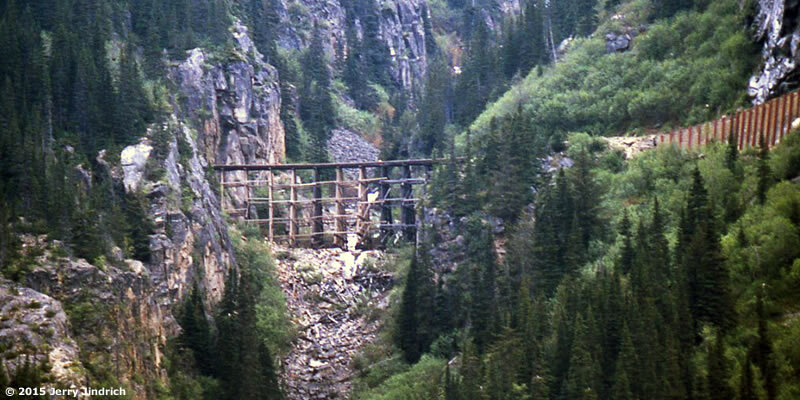 Yes, our train did cross that sturdy (but rickety-looking) trestle, going and coming. And, yes, all the trains we saw were pulled by diesel engines, but the WP&Y does run steam engines at certain times.